﻿ Tang Dynasty Hotel, Kota Kinabalu | FROM $31 - SAVE ON AGODA! 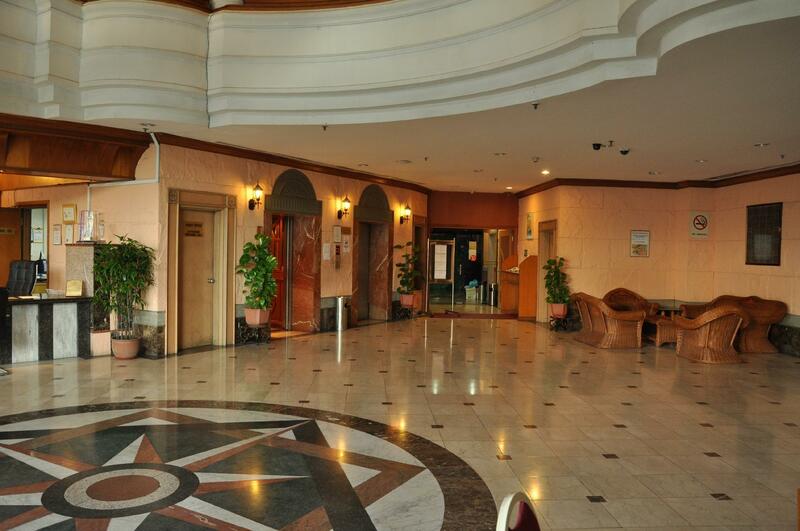 "Affordable, comfortable and spacious room"
Have a question for Tang Dynasty Hotel? "Good location as it is near to the tourist attraction"
Offering quality accommodations in the restaurants, sightseeing, shopping district of Kota Kinabalu, Tang Dynasty Hotel is a popular pick for both business and leisure travelers. The city center is merely away, and the airport can be reached within minutes. With its convenient location, the property offers easy access to the city's must-see destinations. Tang Dynasty Hotel offers impeccable service and all the essential amenities to invigorate the weary traveler. Facilities like daily housekeeping, taxi service, 24-hour front desk, luggage storage, Wi-Fi in public areas are readily available for the convenience of each guest. Guests can choose from 230 rooms, all of which exude an atmosphere of total peace and harmony. Whether you're a fitness enthusiast or are just looking for a way to unwind after a hard day, you will be entertained by recreational facilities such as fitness center. Discover an engaging blend of professional service and a wide array of features at Tang Dynasty Hotel. We chose this hotel for the gym and swimmingpool. The gym vere closed and look liked it Been closed for years. The pool was disapointing. No sunbeds and not even a chair at the pool area. The hotel was dirty and it smelled of wet dog. The carpets was all over dirty. I reported to the reception staff about water leaking continuously from the cistern tank of the toilet. I took off the lid and saw water leaking out 24/7. It is also very noisy and forced to shut the bathroom door. Two days later, nobody fixed the problem. What it needs is a new control like a ball cot to stop water overflowing., cheap simple device. Not only its noisy and disturbing your peaceful sleep, what a sheer waste of resources. Hate to think how much money and water goes down the drain. Definitely not recommending this hotel. This hotel is highly overrated in Agoda ads which misleading to the customer. Not sure if the review is genuine or spam bots or being pay for. Self experience was far it. Worst experience so far we had in 10 years with Agoda. First day arrived, bellboy did not help with trolley until we wheel in over our self then he realize we have quite a luggage's. Check in experience take long time, on 2 two on duty despite have extra counter. the front desk staff is not friendly, you not felt welcoming. First day they forget replenish the towels and again twice they forget to replenish the towels, call from the phone, engaged. twice the lifts broke down, this hotel didn't come with fridge so a whole week stay is pretty tough, it pretty run down, the hotel room lights very dim, basically epitome of disaster. Pro: good location! Other than that spoil my mood for vacation. 1)staff not very friendly (especially customer service) maybe due to lack of staff not sure.please look forward into this matter 2) inform that there are wifi available and will give feedback regarding wifi that cannot connect later but until we check out still haven't give any feedback..bad service..
Used to be my favourite hotel around Kota Kinabalu. As you can refer to my booking history. I never give any bad feedback or comment before. But unfortunately my recent stay was really disapdisappointing. Dirty bedding. Smelly pillows, blanket and bedsheet. I found some hairs on the pillows. Seems like they never change it. Noisy aircondition Dirty towels Hopefully, in the future the hotel management will take action on this matter. 1. Check in & check out time too long. 2. Room was big but VERY smelly. 3. No hose for toilet. 4. No baby cot (i have to DIY my own baby cot by combining the chairs with cushions) 5. Some tv channels not working. 6. Room lights were very dim and needs maintenance. 7. Room service was very POOR: - toilet not dry. - room wasnt cleaned enough. - trashes that i gathered were not thrown (they only threw thw ones in the bin). - they only gave toileteries that were only used (hotels that i stayed more than 1 night gave coplmplete toileteries). - mugs were not cleaned. 8. Pillow was very SMELLY. 9. Room has a very DAMP SMELL. 10. Basement parking is dirty & smelly. 11. They did not tell us that hotel guests are not allowed to park outside the hotel (we got fined by the authorities for parking without parking coupons). I have stayed in cheaper hotels than Tang Dynasty, but never encounter situations like this, esp on cleanliness as i have a 5, 3 & 2 yr olds children staying!! I made a booking under my agoda account for my friend. A few day before the arrival on 19th dec 2018, i've contacted the hotel to request for non smoking room and they approved. On the check in day, my friend arrived a bit late, around 9pm. They have travelled from outer kk with a young kid and a baby. A long journey and tiring. Unfortunately, during check in, she was told, there was no booking under her name or under the booking ID. Then, the hotel asked her to email her voucher to them. Then let her to check in. Now, if the hotel did not have the booking, why do they replied my request on the 19th? Next, once entering the room. The tv remote control was not functioning, there were no towels and floor mat. My friend contacted the housekeeping and they said all those things were insufficient due to full house. She even went down to the counter and told about the situation fearing that the hotel may charge her of taking the towels later during the check out. Thank you for your comments. We will improve our service and facilities accordingly. Dirty mattress cover, very old pillow and old mattress with bad odour. Can see foot steps and blood stain on linen. Shower towel the same, not hygiene. Stay few days, requested changed everyday and but still the same. Broken kettle. All we need is only basic. Please make major upgrade to your basic necessity! Room - aircond bad ... they move us to new room lucky the aircond was ok... staff?? Front counter ,bell boy & maintenance was ok BUT!!! The cleaner was rude btw😑 she doing cleaning at lobby when i was sit n ask me to go away from there bcz she want to do cleaning... others they good...ohhh my check in is struggle btw--- reception didnt have my record booking even i give the prrof..🙄..
First, receptionist should learn how to greet customers when they check in & learn how to smile more & be helpful / friendly. Housekeeping also should know how to smile to customers who pass by them. Breakfast is not included so pls check before you purchase. Room is spacious & clean. Love the bed. No slippers. When i asked for a glass of water during breakfast, there is still someone’s lipstick mark on the cup. Overall, the two days stays were just average. 3 stars. Pro : - Close to Imago Mall - Foodcourt Anjung senja Cons: - Pool slightly dirty especially for kid sections - Light on the room too dim. Use white lamp if possible. - For smoker, this hotel not for you for those who want smoking inside the room.